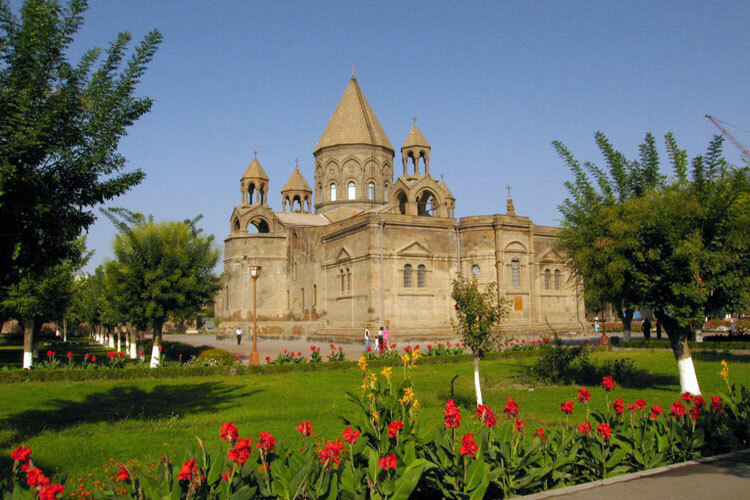 Ejmiadzin, which means the «The Descent of the Only Begotten Son» is an ancient capital of Armenia. According to legend, Jesus Christ descended from heaven and indicated the spot for a church to be built. Holy Ejmiatsin Cathedral was erected at that site in the 4th century (301-303), at the dawn of the Christian conversion of the country by King Trdat III and Saint Gregory the Illuminator. The Cathedral was built on top of the pagan temple of Vagharshapat, after it was destroyed by King Trdat. As you return to the cathedral on the northern face, you can see the different strata of construction, beginning with the main wall, which has blocks of stone from the original 301-303 AD edifice, inscribed in Greek, the language used before the adoption of the Mashtots Armenian Alphabet (ca. 405 AD). You can also see angled cornices in the upper wall, which show where the original roofline was. Armenia was the first country in the world to adopt Christianity as its state religion. Ejmiatsin is the residence of the Supreme Catholicos of all Armenians and the center of the Armenian Apostolic Church. Every seven years, the rite of blessing of holy chrism is held here; thousands of believers come to Ejmiatsin as pilgrims from different parts of the world for this ceremony. 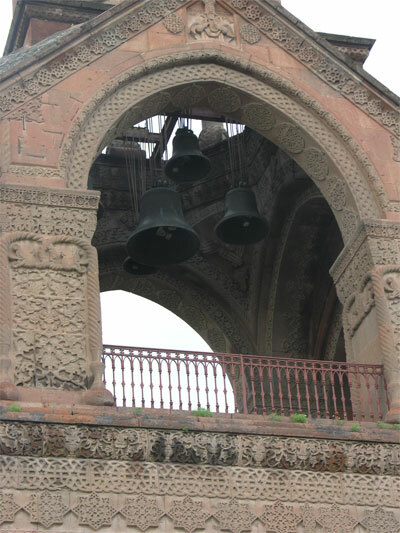 Hripsimeh Vank is located 2 kilometers east of Komitas Hraparak on Mashtots Poghots, and is the first stop by tourists visiting Ejmiatsin from Yerevan. Hripsimeh's martyrdom, as well as those of Gayaneh and 37 other Roman maidens precipitated King Trdat's madness and later conversion to Christianity. As such, Hripsimeh is often sited as the determining factor in the conversion of the nation. Trdat attempted to persuade Hripsimeh to marry him. However, Hripsimeh became more and more eloquent in her refusals, finally declaring she could not wed one when she was already promised to another. Furious, Trdat demanded to know her suitor. «Christ», was the reply, and in a rage Trdat had Hripsimeh and the rest of her entourage beheaded, their bodies buried in a common burial site. The original martyrion was built in the 4th century over Hripsimeh's burial site and was reconstructed in the 5th century as a two-story monument (a 5th-6th centuries picture of the monument can be found carved on the southeast stele at Odzun Vank in Northern Armenia). Visiting Ejmiatsin we can not neglect Astvatsatsin also called the «village» or «peasant» church. Astvatsatsin is in the heart of Ejmiatsin. It houses a beautiful Rococo style altar, the only of its kind in Armenia and hold one of the most elegant altars in Armenia, a work of Italianate art in itself. Ejmiatsin is the most popular destination in Armenia. In addition Ejmiatsin lies in the heart of Armenia's Cradle of Civilization, an area that gave birth to the first bronze and iron civilizations in the ancient world.